Washable Nylon Linen Cart Covers . 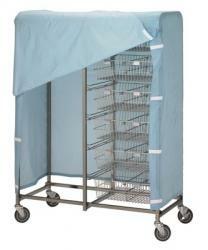 Durable, custom made cart covers protect linen from cross contamination during transportation. All covers have reinforced corners and are available with zipper or Velcro tab closures. NOTE: All cart covers are custom made and therefore not returnable. To determine the correct size, measure the width, length, and height to the top of the casters. Please measure actual cart size ,We can make any size .